If a person has a Child Arrangements Order for a child to live with them they will not be acting unlawfully if the child is taken or sent out of the UK for up to 28 days without the appropriate consent. If a person has a Special Guardianship Order for a child they will not be acting unlawfully if the child is taken or sent out of the UK for up to three months without the appropriate consent. A mother can take a child out of the UK without a father’s permission if the father does not have Parental Responsibility. Abduction where a child is taken overseas without the other parents consent—this may be a criminal offence under UK law. Wrongful retention where a child has been kept in a foreign country following an overseas trip without the appropriate consent. Threat of abduction where there is a risk that a child will be taken overseas without the appropriate consent. It is a criminal offence under the Child Abduction Act 1984 for a person connected with a child under the age of 16 to take or send that child out of the UK without the appropriate consent. Court if the child is detained or a ward of court. What if I cannot obtain the appropriate consent to take my child abroad? When two or more people with Parental Responsibility for a child (or in the list above) cannot come to an agreement about taking the child out of the UK, then the person wishing to take the child will have to obtain the courts permission to do so. Details on how to do this are detailed further below on this page. It may be a criminal offence and/or contempt of court to take the child out of the country without the appropriate consent. How long can I take my child out of the UK for without breaking the law? If a parent has a residence order in place (before 22.04.14), or is the holder of residence under a Child Arrangements Order then they may take the child out of the UK for up to 28 days without the consent of anyone else who has Parental Responsibility for the child unless there is an order in place expressly prohibiting this. If the parent intends to take the child out of the UK for longer than 28 days, then they will need the appropriate consent. If this cannot be obtained then a court order would be required. The courts can impose restrictions or require that a passport be surrendered if a parent is concerned about the frequency of trips abroad or fears that the other parent may abduct the child. If a parent wants to take the child abroad for a short holiday it is sensible to seek the agreement of the other parent before going. Parents should be reasonable about this and provide the other parent with plenty of notice. How can I stop my ex partner moving to another area in the UK with my child? It would be considered advisable to seek the consent of other persons with parental responsibility before moving to another area in England and Wales. However, it is not unlawful to do so without seeking the consent of other persons with Parental Responsibility. It is possible for the left behind parent to apply for a prohibited steps order and this would ask the court to prevent the parent intending to move from being able to do so. The Court of Appeal has confirmed that the court will consider the distance that the parent wishes to move and how straightforward it will be to facilitate contact with the parent left behind. What happens when a child is abducted, but remains within the UK? It is not the criminal offence of abduction to remove a child to Scotland, Wales or Northern Ireland. However, the consent of a person with Parental Responsibility is required to remove a child, even temporarily, from the jurisdiction of England and Wales. It is a criminal offence to remove a child to the Channel Islands or Isle of Man without the appropriate consent. If there are any existing court orders in respect of the child under 16, they will be recognised and enforced in all courts over the UK as long as the order has been registered in the court of that jurisdiction. You will need to send a certified copy of the order to the court who can then register the order and acquire the power to enforce it. An application can be made to the High Court for the return of a child under the inherent jurisdiction. (This is also the process for securing the return of a child if the child has been taken to a country which is not part of the Hague Convention). This is explained in part 3 of Practice direction 12F. How can I trace my child within the UK? The longer it takes to trace a child, the harder the effective return of the child may become and the more likely the child is to be settled in their new residence and another disturbance may be against their best interests. A Local Authority who has Parental Responsibility for a child by virtue of a care order or an Emergency Protection Order may apply to the court for a recovery order to have the child’s whereabouts found. If the child is believed to be within the UK but their location is not known, it is possible for parents and connected persons to make a court application to try and determine the child’s whereabouts. This can be done using a C4 form which can be obtained from your Local Family Court. For more information on this application see our page on Locating a child. What happens if I illegally removed my child from the UK, but I was unaware that I was breaking the law? If a parent removes their child from the UK without the appropriate consent then they will be committing a criminal offence. where the other parent whose consent is required has unreasonably refused to give that consent—this defence is not available if the person who refused consent holds a Residence Order, residence under a Child Arrangements Order or a Special Guardianship Order or if there is an order in place prohibiting removal. I am an unmarried father without Parental Responsibility, what can I do to prevent my child’s mother from taking my child? If an unmarried father without Parental Responsibility fears that his child will be taken to another part of the UK, then he could consider getting a Prohibited Steps Order and/or applying to become the resident parent under a Child Arrangements Order. A Prohibited Steps Order, if granted by the courts, will prevent the mother taking the child and may require that the child’s passport is surrendered. A Child Arrangements Order, if granted by the courts, will decide where and with whom the child shall live. For more information on a Child Arrangements Order see our information page on Residence. If an unmarried father without Parental Responsibility fears that his child will be abducted and taken out of the UK, there are some steps he can take to prevent this. How can I prevent abduction? Alert the local police station; the parent will be asked to make a detailed statement. A Prohibited Steps Order from the courts to prevent the removal of the child from the UK. A breach of this order would be contempt of court. A Specific Issue Order could settle a dispute about whether a child is allowed to leave the UK. To apply for a Prohibited Steps Order or Specific Issue Order you will need a C100 form. This can be requested from your local Family Court or downloaded here. For information on fees for this application, please contact your local Family Court. If you are on a low income and/or in receipt of certain benefits, you may be eligible for a fee exemption or fee reduction; please see form EX160 and guidance form EX160A for further details on fee exemption. Once the C100 has been completed you would need to file this at your local Family Court. For further details on this process and what the court will take into account when making a decision please see our How-to Guide on Removal from Jurisdiction. A Child Arrangements Order to determine with whom the child should live (this can be applied for on a C100 form). In certain circumstances a parent could apply to the High Court to make the child a ward of court, this will immediately freeze the situation and prevent the child being taken abroad, and any attempt to take the child abroad will be contempt of court. If you are seeking this route please contact a Solicitor or see our information page on Wardship. Contact HM Passport Office and ask them to surrender a passport or ask them not to grant a passport to the child. They will usually need to see a court order (as mentioned above), but they are not necessary in the case of unmarried mothers wishing to lodge an objection. Contact Reunite: The International Child Abduction Centre. They can provide parents with a Child Abduction Prevention Pack. If there is only one parent with Parental Responsibility for the child, the parent is able to lawfully remove their child from the UK providing that it is not forbidden by a court order. Where there is another person or persons with Parental Responsibility, the parent will need to obtain either oral or written consent from those people. Where there is a residence order in place (before 22/04/2014), a Child Arrangements Order or care order in place, written consent from everyone with Parental Responsibility will be required. What do the Court look at when considering whether to grant permission to take a child abroad? The courts will decide the case with the welfare of the child being their paramount consideration and make their decision by determining what is in the best interest of the child. the powers available to the court (such as prohibited steps or specific issue orders). there must be significant opportunity for the child to continue contact with the parent left behind. For further details on moving abroad permanently and the court process, please see our How-to Guide on Removal from Jurisdiction. What do I do if my child has been abducted and may be taken to another country? Report the incident to the police. When a child has been abducted and is considered to be in danger of serious harm or death, the police will use The Child Rescue Alert Scheme. This can provide an early warning system to local radio and television stations. The police also have the power to arrest anyone who is suspected of abducting a child and they can circulate the child’s name to all UK points of departure via the Police National Computer. Contact a solicitor in the UK or organisation that can help such as Reunite, The Foreign and Commonwealth Office or the International Child Abduction and Contact Unit at the Official Solicitors Department. Some countries are members of an international agreement which seeks to return abducted children to the country in which they normally live. This agreement is known as the Hague Convention. To check whether a particular country has signed the Convention click here. What can the law do to help me if my child has been abducted and taken to another country? These Conventions have created a network of countries who work together with the intention in most cases to return the abducted child back to their place of residence. The countries that have joined the Conventions are known as Contracting States. The UK is a Contracting State to both Conventions. To rely on the Hague Convention, the child must be under 16 and have been habitually resident in one contracting state and taken to another. How can the Hague Convention help me? A parent can apply to the Central Authority where the child is usually resident or to the Central Authority of any other contracting state for assistance in securing the child’s return. The Central Authority of the country where the child is shall take all appropriate steps to obtain the voluntary return of the child. If this is not possible, court proceedings can be bought. If a claim of wrongful removal or retention is made within the first 12 months, the contracting state where the child is will usually return the child to their original country so that the court in that country can decide what should happen in the child’s future. After the 12 month period, it is more difficult for the child to be returned as the child may be settled in their new environment. Will my child meet the requirements of the Hague Convention? the child is now settled in their environment. A defence is available to wrongful retention under Article 13(b) of the Hague Convention if it can be established that the child would be exposed to physical or psychological harm, or otherwise placed in an intolerable situation, if the child was made to return to the resident country. the court is not restricted to simply look at the immediate future of the child, but can take a longer-term interpretation. What is the European Convention? Like the Hague Convention, the European Convention binds all the contracting states into working together to return the abducted child back to his or her place of residence. However the European Convention differs from the Hague Convention as it looks at Child Arrangements Orders, previously known as Residence and Contact Orders (before 22.04.14) rather than residence and contact rights. The European Convention can be used to enforce Child Arrangements Orders, previously known as residence and contact orders (before 22/04/2014) however, this Convention has been largely superseded by the Hague Convention. If a child has been taken to a country that is not a joined state to either convention, it is more difficult to have the child returned. What if my child is abducted to a country which is not party to either Convention? When a child is abducted to a Non Convention country, there is not a network of authorities working together to ensure the return of the child. A parent who wants their child returned to the UK will either have to come to an arrangement with the other parent, or start legal proceedings in the country where the child has been abducted to. However, there are still things that the Foreign and Commonwealth Office can do to help. The Child Abduction Unit can give advice and provide practical help when dealing with authorities overseas. Can I get legal aid for abduction? Legal aid may be available for parents and persons with Parental Responsibility for children who are at risk of abduction or have been abducted. secure the return of a child who has been unlawfully removed from the UK. Where a child has been abducted from a country party to the Hague Convention and brought to the UK, legal aid may be available for the person from whom the child has been abducted. This will be as of right without a means or merits test. For more information on legal aid see our information pages on legal aid for family law matters. There is no legal definition of habitual residence; it is a question of fact where a person can be considered to be living their life. wrongful retention, when the child is not returned. There must be a breach of arrangements made with respect to the child otherwise the removal or retention of the child is not illegal for the purposes of the Convention. Where the parent has regular contact and exercises their parental nature with the child, this can amount to custody within the Hague Convention even though there is no order from the court to prove this. Because of this, some unmarried fathers without Parental Responsibility will be able to claim custody rights under the Hague Convention. If a child has been abducted it is important to start proceedings as soon as possible otherwise the child may settle in their new environment. Once a child is settled it is harder to remove the child as it may be in their best interest to remain. 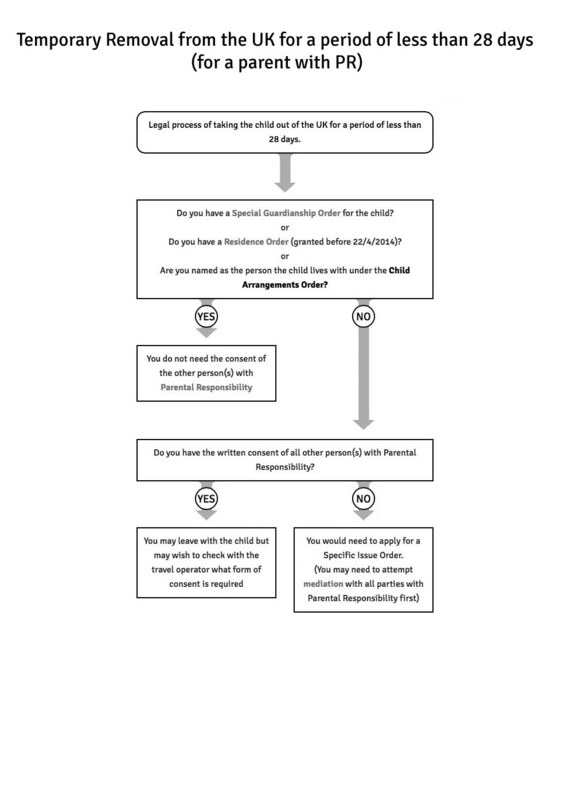 Legal process of taking the child out of the UK for a period of less than 28 days. 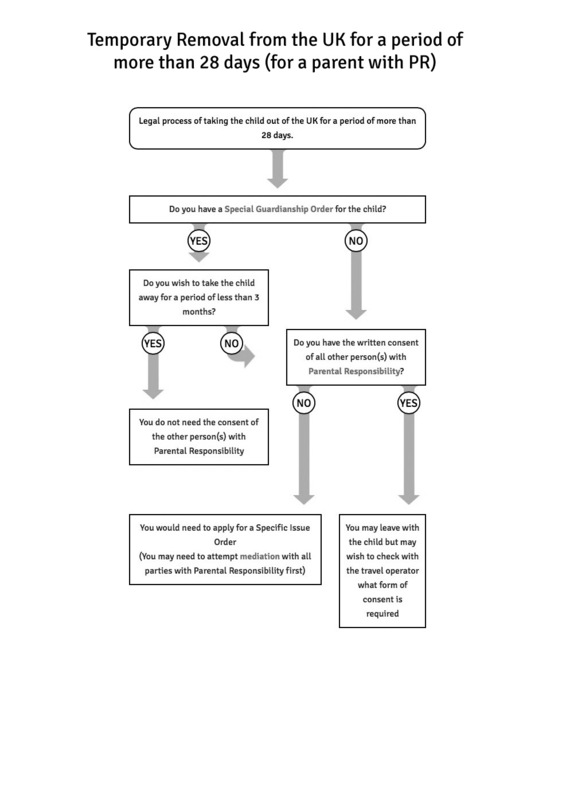 Do you have a Special Guardianship Order for the child? Do you have a Residence Order (granted before 22/4/2014)? Are you named as the person the child lives with under the Child Arrangements Order? Do you have the written consent of all other person(s) with Parental Responsibility? You would need to apply for a Specific Issue Order. Legal process of taking the child out of the UK for a period of more than 28 days. Do you wish to take the child away for a period of less than 3 months? 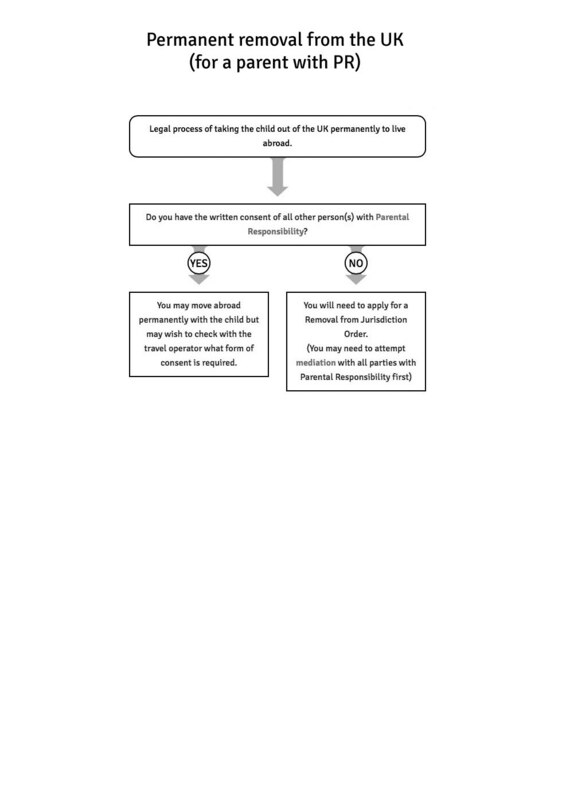 Legal process of taking the child out of the UK permanently to live abroad. You may move abroad permanently with the child but may wish to check with the travel operator what form of consent is required. You will need to apply for a Removal from Jurisdiction Order. This information is correct at the time of writing (Feb 13, 2019 @ 4:36 pm). The law in this area is subject to change. Coram Children’s Legal Centre cannot be held responsible if changes to the law outdate this publication. Individuals may print or photocopy information in CCLC publications for their personal use. Professionals, organisations and institutions must obtain permission from the CCLC to print or photocopy our publications in full or in part.